I don't think 1975 was Laxmikant Pyarelal's finest year (1972-74 was their prime in my opinion), but I came across this cheaply priced two-fer by them, sporting a cover I found appealing, so I took a chance on it anyway, despite not having heard of it before. 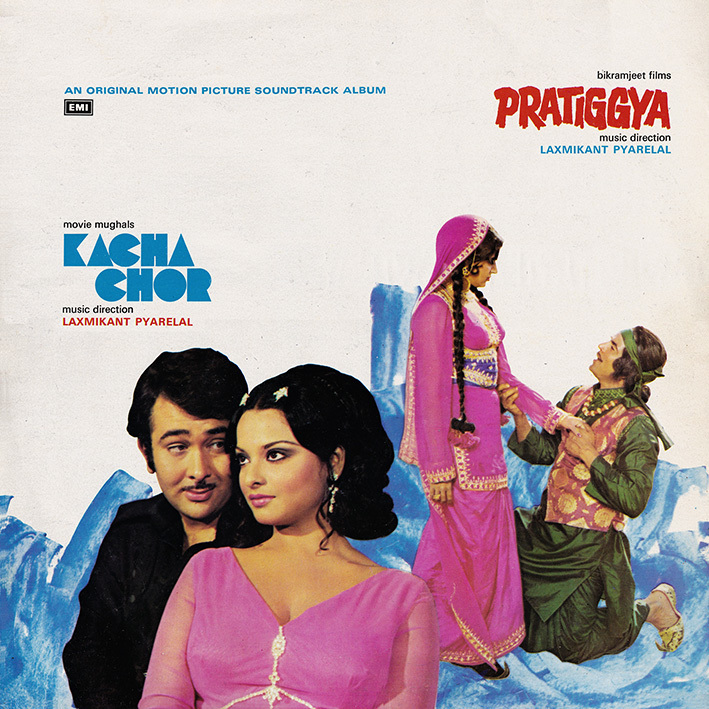 'Kacha Chor' (the film apparently not released until 1977) begins on a high note. Cabaret number 'Pahle Ham Muskurae' is an excellent slice of orchestral exoticism with a good groove and the best thing on side one's predominately traditional and percussion heavy score. The remaining three tracks are OK in a rhythmic sense but hardly anything that sticks in the mind. I prefer 'Pratiggya' [review]. Its music has much of the same quality as above, but 'Morni Se Morni' and 'Pardesi Aaya Des Men' are songs I'm more likely to return to. And I'm quite enamored with 'Uth Neend Se Mirzia Jaag Ja', an unusual sounding track that combines a strange and haunting melody with a non-stop train-wheel drumbeat. Another rare stuff. Perhaps it falls in the list of your rarest albums ....shared by you PC. Only a true vinyl lover can understand its worth bro. Though I have my own rip of this rarest and expensive LP but could not stop to congratulate you for this finest soundtrack sharing. May be rip quality would be deferent from ones own choice but your selection of this LP is unique. This LP is so much in demand that its cover is also worths over 500.